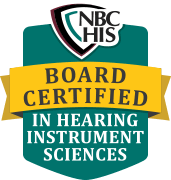 We're the National Board for Certification in Hearing Instrument Sciences, and we set the standards for excellence in the profession. If you're a hearing healthcare professional, count on us for certification and career support. If you're a consumer researching hearing instrumentation and related audilogical services, as well as looking for a hearing healthcare professional, we can help. It's your assurance that you've chosen a Board Certified Hearing Instrument Specialist. That means they've taken extra measures to demonstrate their commitment to your hearing health by meeting specific continuing education requirements. Abiding by the NBC-HIS Code of Ethics, and NCCA guidelines, they operate at the highest level of competency set by international standards. Go to http://www.nbc-his.com/digitalbadge/ for information on your digital badge! Go to http://www.nbc-his.com/orders/ for your new promotional merchandise!